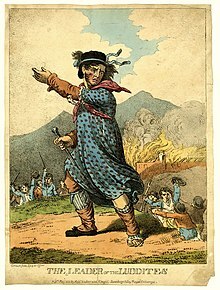 The Luddites were a group of English textile workers and weavers in the 19th century who destroyed weaving machinery as a form of protest. It is a misconception that the Luddites protested against the machinery itself in an attempt to halt the progress of technology. Over time, however, the term has come to mean one opposed to industrialisation, automation, computerisation, or new technologies in general. The attack of the Luddites was not occasioned by the introduction of new machinery, however, as is commonly thought, for there is no evidence of such in 1811 and 1812 when Luddism proper began. Rather, the destruction was leveled at the new slip-shod methods which were ordered into effect on the extant machinery. Not an attack against production on economic grounds, it was above all the violent response of the textile workers (soon joined by others) to their attempted degradation in the form of inferior work; shoddy goods — the hastily-assembled "cut-ups," primarily — was the issue at hand. To wonder what was so radical about a movement which seemed to demand "only" the cessation of fraudulent work, is to fail to perceive the inner truth of the valid assumption, made on every side, of the connection between frame-breaking and sedition. As if the fight by the producer for the integrity of his work-life can be made without calling the whole of capitalism into question. The demand for the cessation of fraudulent work necessarily becomes a cataclysm, an all-or-nothing battle insofar as it is pursued; it leads directly to the heart of the capitalist relationship and its dynamic. This page was last edited on 2 February 2018, at 20:11.